No doubt about it, Roger Federer has been a game changer. With so many players now peaking later in their careers and continuing to play their best tennis into their 30s, the 34-year-old Swiss believes it is down to a change in professionalism and attitude, sparked by his own and others’ commitment to the tour. 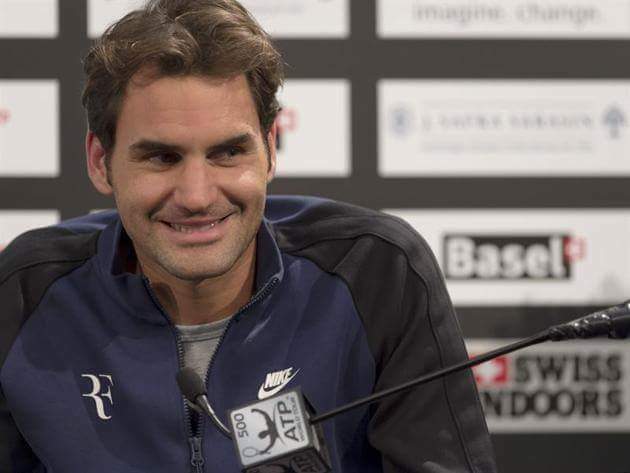 Speaking at the Swiss Indoors Basel on Sunday, Federer explained how the norm in tennis has shifted, with players now contesting a full calendar and allowing no let-up as the season draws to a close. The lure of the prestigious ATP World Tour Finals has players chasing points until the end in a bid to land one of the coveted eight places in London. Indeed, while other players are still fighting for the two remaining spots at this year’s Final Showdown, Federer is also hoping for a big finish to end the year above Andy Murray as No. 2 in the ATP Rankings. “We were a good generation,” said World No. 3 Federer. “We were in the transition of becoming really professional, understanding that we need to change our life around to become more physical. “The end of the season was always a grind, you just felt tired thinking about it. A lot of players would check out. I don't feel that's the case anymore. Federer is preparing to make his 16th appearance at his hometown tournament in Basel. The right-hander has a 56-9 record at the ATP World Tour 500 indoor hard court tournament, lifting the trophy six times, most recently triumphing last year with victory over David Goffin. Casting his mind back to his first appearance in 1998, when he lost in the first round to Andre Agassi, Federer reminisced about a vast change in expectations over the course of the past 18 years. “At first, let's say winning maybe five or six games in the first round was going to be a good result,” said Federer. “Then it was maybe if you win a set, it would be great. Winning a round would be great. Next thing you know, I was defending titles. It would be nice to do that again. That's changed obviously a lot in the approach and with experience, I'm less nervous and less anxious. “I still enjoy it as much as ever. It's true that the routines now are easier. I know how to handle ticketing. I know how to handle having friends here and family. In the beginning there was just so much going on that it was kind of crazy, but in a good way. I remember I was always very nervous on court because I always wanted to do so well here. Federer is due to open his bid against Mikhail Kukushkin, whom he leads 2-0 in their ATP Head to Head series. The Basel native is looking claim his 1050th match win and is chasing his sixth title of the season this week.